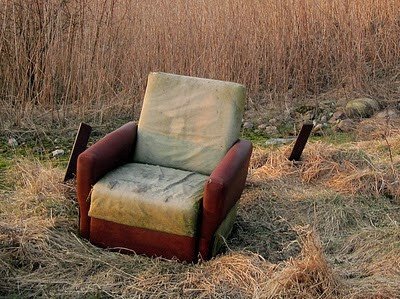 to sell his old armchair as a "cultural treasure for the nation"
but admits he's disappointed by the lack of response. His agent suggests he tries eBay. The Dahl family are appealing for £500,000 to repair a few floorboards in Roald Dahl's garden shed. How much would the Author need to buy a shed from B&Q to house his old armchair and save it for the nation? About £135 - that's $200 US - for the 'Easy-Fit' self-assembly model complete with pitched roof and smart side window. A small price to pay for a national treasure. Is the armchair dumped in Author's back garden? It looks like it was dumped in a field!